Does this come with one touch memory height adjustment? Yes, one of the best features of the Advanced Keypad is the one-touch memory height adjustment. Once you have your presets programmed, simply press the number and watch as your desk moves into place. Do these work on 3-leg and 4-leg UPLIFT Desks? 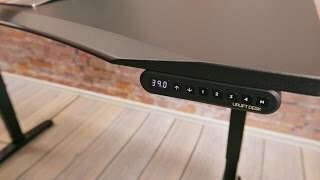 Can I change my desk's minimum/maximum heights with this keypad? Yes. Another added feature of the Advanced Keypad is the ability to change the minimum and maximum heights of your desk. This is a handy safety feature to have if you have any obstacles, such as a shelf or pedestal drawer, that might get in the way of the generous UPLIFT Desk height range. Check out our blog post for more information. Is the advanced keypad really worth it? You betcha! The four memory presets make it so that you don't have to remember the perfect standing height. The one-touch feature is also great! Just touch the memory button and then sit back and watch while your desk moves into place. Does this work via Bluetooth? This is not Bluetooth compatible. All components have to be hard wired to the control box. Does this come with all of the wires necessary to hook up to my desk's control box? Yes, the Advanced Keypad comes with a connecting wire, which allows it to work with the desk via the control box. How do I program a height into my keypad? Move your desk to the height that you want to remember. Then press the M button followed by the 1, 2, 3, or 4 button corresponding with the preset number you want to program. I have a two button keypad on my desk now, am I able to upgrade? Most likely you will be able to upgrade! But it does depend on when you purchased your UPLIFT Desk. Please give our Sales Pros a call and they can tell you for certainty whether your desk is compatible. Can this be used with any standing desk? The UPLIFT Advanced Keypad is only compatible with the UPLIFT line of desks. I have an older control box. Will this work for me? In most cases, yes. The Advanced Digital Memory Keypad is designed to work with our version 2,3, and 4 control boxes. This accounts for a majority of users, but there is one early version of our control box that is not compatible with the keypad. If your control box looks like the box below, you have one of our first control boxes, which is not equipped to work with this keypad. How can upgrade to a new control box, however, which will allow you to install the Advanced Keypad with all of its included features. The Advanced Digital Memory Keypad comes in your choice of black, white, or gray. Go from sitting to standing, easily and stylishly with the addition of the Advanced Digital Memory Keypad.